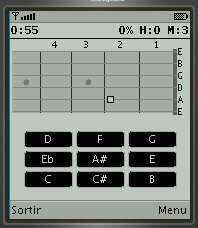 Fretuoso for iPhone, iPod touch and iPad is now available! 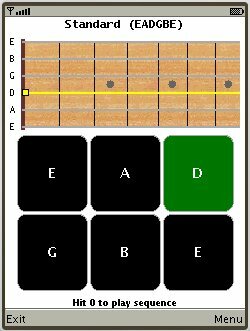 Learn the location of notes on the fretboard of a guitar or other stringed instrument. 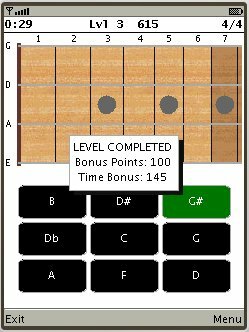 Training mode allows to focus learning on particular parts of the fretboard, and even focus on individual strings. Game mode provides a fun way to make progress. Work your way through levels of increasing difficulty! 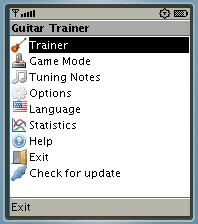 Train your ear at the same time as you improve your working knowledge of the instrument. Display notes as letters (A, B, C...) or solfege syllables (Do, Re, Mi...). Left-handed and right-handed neck types. Tune your instrument with your cell phone. Open string tones can be produced for any of the supported tunings! Dynamic user interface that works on a wide variety of mobile devices. Support for pointer input (stylus, touch screen, etc). Available in many languages: English, French, Spanish, Italian, Romanian, Finnish, Polish, Russian, Ukrainian, Catalan, Brazilian Portuguese, German, Turkish, Dutch, Chinese, Hindi and Hebrew. Most devices on which you can play games will work.